Of Two Minds - Are Central Banks Losing Control? If you want a central banker to choke on his croissant, read him this quote from socio-historian Immanuel Wallerstein: "Countries (have lost the ability) to control what happens to them in the ongoing life of the modern world-system." Stated another way, Wallerstein is asking: what do central banks no longer control? The quote is from Wallerstein's recent meditation on China: China is Confident: How Realistic? "The question is how realistic is this self-assessment of China? There are two premises embedded in China’s self-confidence, whose validity need to be investigated. The first is that countries, or rather the governments of states, can actually control what is happening to them in the world-economy. The second is that countries can effectively contain popular discontent, whether by suppression or by limited concessions to demands. If this was ever even partially true in the modern world-system, these assertions have become very dubious in the structural crisis of the world capitalist system in which we find ourselves today." Central banks still claim absolute control over their currency, interest rates, what's legal/outlawed in their financial systems, and so on. Wallerstein is suggesting that era has ended and central banks are losing control of the value of their currency, their role in the global economy and the social discontent that is the ripening harvest of central bank policies that have greatly enriched the rich at the expense of everyone else. I don't think Wallerstein picked China out a hat. 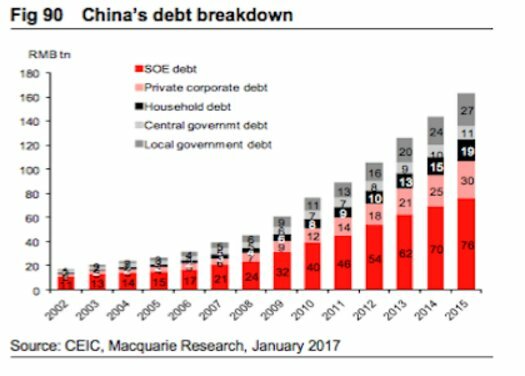 Though every central bank is experiencing the same erosion of control, China is visibly losing control of the value of its currency, the yuan, and its runaway debt burden, which has skyrocketed from less than 20 trillion RMB 13 years ago to over 160 trillion RMB. This matters because instability in a nation's currency quickly spreads to the economy and then to society: as a currency depreciates, the value of everyone's money declines, i.e. the purchasing power of their money is diminished. When a currency is devalued, everyone holding that currency is instantly poorer. When people become poorer through no fault of their own, they become angry with the authorities who engineered the devaluation or let it happen. This leads to the social discontent Wallerstein references. Another erosion of purchasing power occurs when wages stagnate while the price of goods and services rises. Can central banks control the erosion of wages' purchasing power? There is little evidence they can. As for a central bank's control of its role in the global economy: those confident in China's ascent to global #1 power assume China will remain the world's workshop at least until its domestic populace can absorb all the goods it produces. But it seems increasingly evident China's role as the world's workshop is under threat, and that it doesn't control the erosion of that role. Domestic populism is trending against globalism, wages are rising in China as the populace urbanizes, prices are rising faster than wages and the potential for disruptive trade wars is rising. As for what's outlawed/banned: recently, I've been engaged in some lively online debates about the possibility of China banning bitcoin transactions. Most people in the discussion reckon China (or any government with a high degree of control of its populace) can shut down bitcoin with no difficulty. The threat of a severe penalty would be enough, or so I'm told. I'm not so sure. Look what prohibiting alcohol did: it created an entire economy devoted to bypassing the authorities' restrictions on alcohol. The penalties were fairly severe, but threats didn't work when profits beckoned. If a nation's currency is losing purchasing power, threats are unlikely to be effective. Indeed, threatening the populace as they try to retain the purchasing power of their capital/savings would be an act of desperation born of a recognized loss of control. Wallerstein is right: central banks--including the Federal Reserve-- are losing control of the value of their currencies, their role in the global economy and the social discontent that arises as central bank policies negatively impact average citizens. It's by no means guaranteed that central banks will be able to maintain their death-grip on interest rates, either. 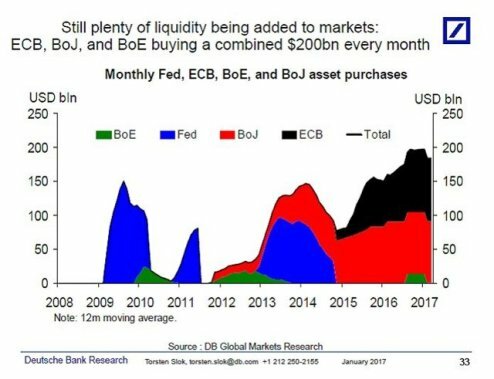 Eight years after the crisis of 2008-09, central banks are still injecting $200 billion a month into the global financial system to keep it from imploding. The returns on their "investment" is diminishing rapidly, and they're losing control of everything that matters. Thank you, Christi N. ($60), for your superlatively generous contribution to this site -- I am greatly honored by your steadfast support and readership. Thank you, Beki H. ($50), for your superbly generous contribution to this site -- I am greatly honored by your steadfast support and readership.